UPDATE: Yes, this Sold June 2017. The virtual tour played a vital role since it was viewed outside the U.S. International home buyers are starting their search online, and that’s why I work with my clients to maximize my digital marketing strategy. Contact me for help or to meet to put together the sale of your home. When clients asked me to list their condo in McLean recently, they asked me some very specific questions about how I would do it differently than every other Realtor they had talked to? Since they are a family of four living there, my first goal was to disrupt their lives as little as possible. The second goal was to make sure every buyer could get inside to see their place. I totally understand home buyers want to sift through and eliminate the junky listings at home, and then see only the best stuff. They are busy and really don’t have the time to get into multiple elevators, check in at multiple front gates, or discover that the view is of another building or air shaft. 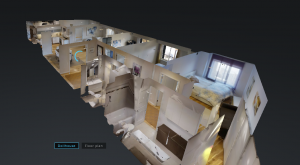 To go beyond the professional photos, adding a 3D virtual tour seemed like an ideal marketing tool that would allow home buyers to check it out on their own as long as they wanted. Have you looked through the 3D virtual tour above? On any device, it is pretty cool. It is done using a special 360-degree Matterport camera that scans the space from each round focal point. Controlled by a photographer using an iPad, the property springs to life as he is shooting the images. It is a 3D experience for real-world real estate buyers. I have found that this works best on iPads, iPhones, or probably any mobile device. Since it is such a new technology, Matterport likely designed it for that type of user. Before you think that everything in the 3D tour is fake furniture from the staging store, or computer generated (CAD) enhancements, I want you to know that what you are seeing is their stuff. Yes, their own furniture! What I prefer to do when helping seller clients is to have a few meetings before any photos are taken. The second meeting will be my first advice session putting together a list of things to get started with before our third meeting. The third meeting involves my professional staging designer who is going to help us create “the dream” home that will stand out. This is why I like to tell people it will take about 30 days to get your house ready to sell. My goal is to bring our powerful Sotheby’s branding to any home. Really. It amazes me when I see terrible photos or realtor jargon used when marketing a home. It’s always missing an opportunity to help… help both seller and buyer see the maximum potential. I have been lucky enough to sell some exceptional homes in all price ranges, so let’s talk about your home today.